The new MacBook Air is thin, light, and durable enough to take everywhere you go -- and powerful enough to do everything once you get there. A fourth-generation Intel Core processor and Intel HD Graphics 5000 deliver high performance, while using less power. So you get remarkable battery life: up to 12 hours on this 13.3-inch model. And with up to 45 percent faster flash storage compared to the previous generation and new 802.11ac Wi-Fi for up to 3x faster wireless, the new MacBook Air is quicker and more responsive than ever. The MacBook Air also includes both a high-speed Thunderbolt port and two USB 3 ports, enabling you to easily connect to external displays and a wide variety of high performance peripherals. 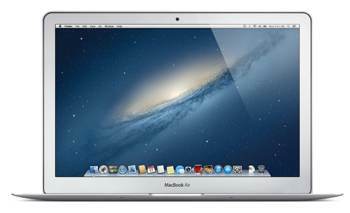 This version of the MacBook Air (model MD760LL/A) sports a 13.3-inch high-resolution display, 1.3 GHz Intel Core i5 dual-core processor (with a Turbo Boost of up to 2.6 GHz), 128 GB of flash memory storage, and 4 GB of RAM (see full specifications below). It also comes with the iLife software suite, which includes the latest versions of iPhoto, iMovie, and GarageBand. The MacBook Air with 13.3-inch screen (view larger). Up to 12 hours of battery life (view larger). Power through your whole work day with the 13-inch MacBook Air, which delivers up to 12 hours of battery life -- more time power for word processing, presentations, email, and more . The increase is due to a larger battery (thanks to the compact all-flash storage in the MacBook Air) and the new power-efficient Intel Core processor architecture. Put the MacBook Air to sleep for more than 3 hours, and it enters standby mode to conserve battery life for up to 30 days. The MacBook Air now supports ultrafast 802.11ac Wi-Fi. When connected to an 802.11ac base station -- including the new AirPort Extreme and AirPort Time Capsule -- wireless performance is up to three times faster than with the previous generation of MacBook Air. And your Wi-Fi range improves as well. The ultra-efficient architecture of the fourth-generation Intel Core i5 processor was designed to use less power and still deliver high performance. It has a 1.3 GHz speed, which can dynamically accelerate up to 2.6 GHz to match your workload thanks to updated Intel Turbo Boost Technology. And with the Intel HD Graphics 5000 processor, you get up to 40 percent faster graphics -- performance you'll especially notice with games and other graphics-intensive tasks. With USB 3 built into the MacBook Air, you can connect your external hard drive and transfer large files in seconds instead of minutes. 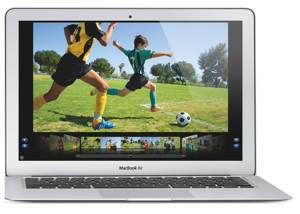 Every MacBook Air comes with two USB 3 ports--with speeds up to 10 times faster than USB 2--and you can connect all your USB-compatible devices, including your iPhone, iPad, iPod, or digital camera. At the heart of every MacBook Air--and every Mac--is OS X Mountain Lion, the world's most advanced desktop operating system. Since the software built into every Mac is created by the same company that makes the Mac, you get a fully integrated system in which everything works together perfectly. OS X works with the processor in your Mac to deliver the best possible performance. Power Nap even takes advantage of the Mac hardware to keep the entire system up to date while it sleeps. Back up a lifetime's worth of memories with AirPort Time Capsule, a wireless hard drive that works seamlessly with Time Machine in OS X. It's also a full-featured Wi-Fi base station with the latest 802.11ac technology and simultaneous dual-band support. Choose from 2 TB and 3 TB models.